I’ve just updated the Top 10 Ratings page (which also contains the top rated athletes in each of the disciplines, and all Ironman-distance results of the athletes). Please note that this is an updated version of the data in my 2013 TriRating Report, since releasing the report I’ve been working a bit more on my rating algorithm. 2013 was clearly a transition year at the top of the male athletes. Only one athlete in the top 10 (Kona winner Frederik Van Lierde) has had a great year and managed to improve his rating. My new #1 rated athlete is Eneko Llanos. He’s managed to win two regional championships (Melbourne and Frankfurt) and also had a decent finish to the season (11th in Kona and 3rd in Cozumel), already securing his Kona slot for 2014. It’ll be interesting to see if he focuses his 2014 season on another (final?) shot at winning Kona. Timo Bracht in 2nd and Craig Alexander in 3rd are athletes close the end of their career. Timo is a very consistent performer – the last time he was out of the top 10 in Kona was in 2008 when he was DQ’d after reaching the finish in 5th place. Craig has said good-bye to Ironman racing after his disappointing 21st place in Kona. As already mentioned, Frederik Van Lierde is the only top 10 athlete who improved his rating with two great wins in France and Kona. It will be interesting to see how he deals with the added pressure in 2014, but I’m sure with the help of his coach Luc Van Lierde he’ll prepare well. Marino Vanhoenacker (6th), Andreas Raelert (9th) and Dirk Bockel (10th) have to think hard about their plans for 2014. They’ve struggled with injuries, didn’t score any Kona points, and finished the year with frustrating DNFs (Marino in Cozumel and Andreas in Western Australia) or didn’t recover in time for another IM (Dirk with a slight hip injury). 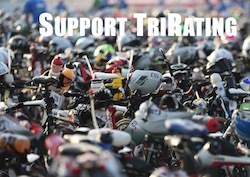 Maybe they should regroup in 2014 before re-focusing on Kona in 2015. Faris Al-Sultan (7th) seems to always be in the mix in Kona, but then can’t quite hold on to his great position on the run. However, he seems to still enjoy racing, and he’s still good enough to win almost any Ironman race. But with the attractive races in the European summer I just can’t see him focus 100% on Kona and risk a full season for another shot at winning Kona. Bart Aernouts in 8th place has developed into the top Ironman runner: He’s posted the fastest run times in Kona for two years, and also had a great 2:37 at IM France. 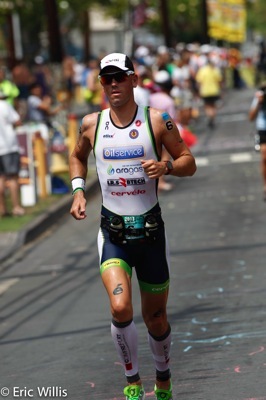 He continues to improve year by year, and should be a podium contender in Kona 2014. Chris McCormack (still in 11th place) probably missed his last shot at a good Kona result when he was forced to withdraw from Kona 2013 with Epstein-Barr virus. I’d be surprised to still see him race at a Top-10-level in 2014. David Dellow (now in 15th place) had some bad luck, catching an infection just before Kona. 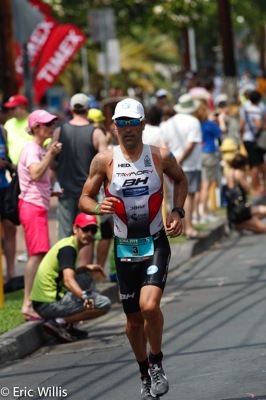 He has recovered and already scored some Kona points by finishing 3rd in Western Australia. Cam Brown is now in 13th place. He was finally beaten by Bevan Docherty in IM New Zealand, then had a disappointing run at Challenge Roth. It’ll be interesting to see how his 2014 season will be, he’s already had some good results in 70.3s. In the women’s ranking, we have a clear #1 athlete: No one can argue that Mirinda Carfrae is currently the best female Pro. She was leading the rankings last year, and she convincingly confirmed the top spot by winning Kona in a fantastic way. I’m not sure how Caroline Steffen judges her year. She’s posted great results (winning Roth and MetaMan), but couldn’t deliver the Kona performance she was hoping for and had to fight very hard for “only” a 5th place finish. There will be some changes to her 2014 season after leaving Team TBB and Brett Sutton. She has just announced that she’ll be coached by Chris McCormack. My new #3 is Rachel Joyce. She managed her season very well, with two great results in Texas and Kona, and a slight injury in between. She used her fitness to win in Cozumel, so she already secured her Kona slot for 2014. She’s been making steady progress from year to year, but there is not much more room! With Liz Blatchford (5th), Julia Gajer (7th) and Jodie Swallow (9th) we have three athletes new to long-distance racing. Liz switched over from short-course racing, qualified late for Kona and then snagged the final spot on the podium. Julia had raced very fast in Roth in the past years, in 2013 she also raced two Ironman races, winning her first IM title in Arizona. Jodie seems to have finally overcome her struggles and is healthy enough for long-distance training and racing. After three increasingly better IMs she struggled with racing in the Kona heat. Mary Beth Ellis (6th) had a pretty good year until she broke her collarbone close to Kona. She couldn’t fully recover, and had to DNF. While she continues to race for Team TBB, she has switched coaches to Siri Lindley – I hope that this will help her find an extra gear in Kona. Linsey Corbin (8th) was pretty much a “no show” in 2013. She struggled with injuries, but managed to pull off a miraculous 10th place in Kona on a long run of just 9 miles. She scrapped plans of racing another Ironman in 2013, so it looks as if she wants to take the time to properly heal this time, and then come back strong for 2014. 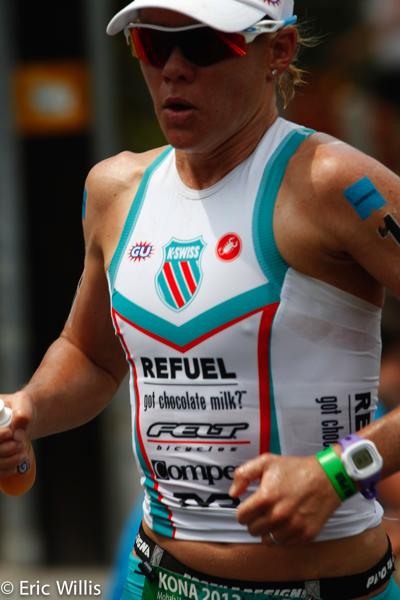 Gina Crawford (10th) has had 6 Ironman-distance finishes in 2013 and continues to post one solid result after another. She has signed with Matt Dixon of Purplepatch in her quest for a top Kona result. Last year’s Kona winner Leanda Cave (now in 11th) was dealing with injuries all year. She finally pulled the pin on a frustrating season, but it remains to be seen if she still has the fire in her to come back in 2014. As a former Kona winner, she just has to validate her Kona slot by completing an Ironman race, and this means she can be a bit more relaxed in planning her season.